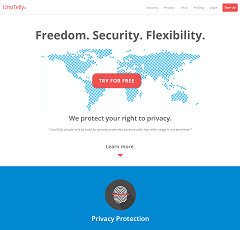 Customers that sign up for UnoTelly’s VPN or DNS subscription service plans do so for a variety of reasons. Some simply want the peace of mind that comes standard with using a private network. There is a heightened sense of security from knowing that prying eyes will not have access when you are online or streaming content. This is one of the primary reasons why many people also use this type of service to stream in their favorite content from other countries that do not prohibit it. Watching your favorite movies through regular channels usually comes with a price, but UnoTelly provides the technology to get it for free. Doing this is not necessarily illegal, particularly if you are downloading or streaming in content that is sourced in from another country that has no restrictions for global access. Whatever your reasons for wanting to use UnoTelly, their service plans are worth the cost even it is for enhanced shielding from potential hackers. UnoTelly offers DNS (Domain Name System) and VPN (Virtual Private Network) subscription plans for customers that want the added security of a private Internet connection and network outside the realm of what the average ISP (Internet Service Provider) offers. What differentiates UnoTelly from standard ISPs is that customer information is protected and kept confidential without the intrusion of activity logs that store browsing data beyond the basics of log in and log out times as well as the bandwidth usage. UnoTelly uses servers that are located worldwide in a series of clusters to provide their customers with maximum coverage connections. Customers that choose to only sign up for UnoDNS will have access to those sites that are approved without any restrictions. UnoDNS is more appealing to some customers as the connection rate in comparison to the UnoVPN is considerably faster. Those customers that are often on the road traveling tend to prefer UnoVPN as it can get past blocked DNS services more easily. Highlights of UnoTelly.com include their Quickstart guide along with the Help Center and the Solutions database. UnoTelly goes that extra mile by giving their customers everything they need to initially get setup followed by online tools that offer additional guidance and support. An online request form is available to help resolve technical issues with the service. Their Frequently Asked Questions (FAQ) page covers just about every topic under the sun that a customer could conceivably come up with. The Terms of Service page is another source of useful information for customers that may want clarification on topics such as membership, free trials, price changes, cancellation and refund policies, and payment methods. Customers that may have questions about prohibited activities will find their answers on this page along with helpful info about warranties, password, and account access. 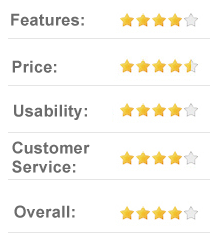 UnoTelly definitely did their homework to make sure that they have satisfied customers. UnoTelly’s Premium Plan comes with UnoDNS and offers customers the option of signing for a free preliminary trial to see if they like the service. 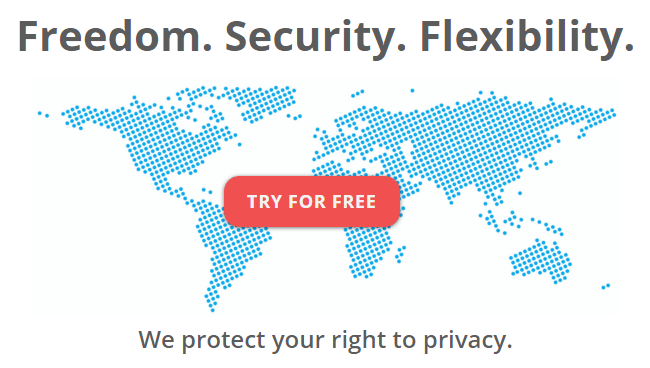 The Premium Plan comes standard with 100% secured DNS resolution that is available in 8 major global languages and compatible with more than 30 countries. Customers have the option to request that their service coverage level be increased plus UnoTelly provides the added assurance of letting customers cancel at any time with no commitments. The Gold Plan offered by UnoTelly includes both UnoDNS plus UnoVPN. It is the best selling service plan and includes the standard feature of the 100% secure DNS resolution along with compatibility for 8 languages and 30 countries. 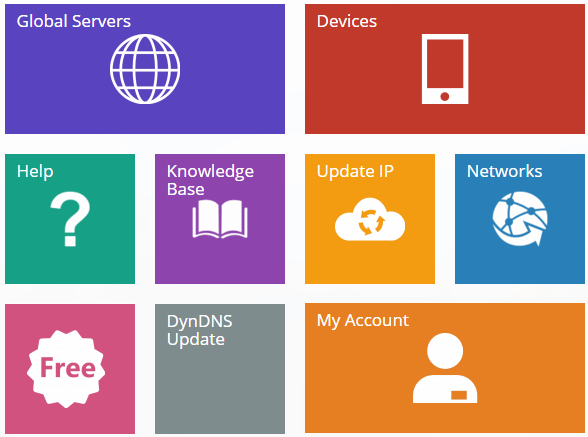 Enhanced service features include UnoVPN along with PPTP as well as OpenVPN Protocol support. Servers are located in the United States, Canada, United Kingdom, and the Netherlands. There are no service commitments and customers many cancel at anytime. After a customer signs up for one of UnoTelly’s service plans, they can access the Quickstart tools, which is like a sitemap that provides guidance for getting setup. Options include checking out the global servers link that navigates to a separate page with listings for both primary and secondary DNS servers with their IP addresses. Other global servers that are located worldwide are also posted along with their server IP, whether dynamo is enabled, and the distance from the site user measured in kilometers (km). Other highlights of the Quickstart tools page includes checking your service account status, compatible devices, and DynDNS update. You can update your IP and check the networks on this page along with the option to log in to your account to check your profile and upgrade your services. The Help Center and Knowledge Base can be easily accessed from the Quickstart page, which offers a wide range of solutions to common problems. Quickstart maintains a detailed listing of all compatible devices that are supported on UnoTelly along with easy guides for setup instructions. The range is quite extensive and includes both small and large devices as well as compatible operating systems and platforms. Clicking on any of the device option links will direct you to a page that provides a visual guide to getting setup and started. Each device offers detailed guidance and instructions along with some tutorials. Current operating system platforms that are supported by UnoTelly include Windows XP, Windows 7, Windows 8, Mac OSX, and Linux/Ubuntu. You can install UnoTelly on your Apple iPad, iPhone, and iTouch as well as Android devices. UnoTelly will work with your Amazon Kindle Fire. Samsung TV supports the UnoTelly platform, which is a great feature for those that prefer to use the service on a larger display screen for a more enjoyable viewing experience when watching your favorite shows. Support services provided by UnoTelly include their Help Center and Solutions pages where customers can find answers and solutions to common problems and issues. The Help Center has a knowledge base that covers a wide variety of helpful topics for their customers. Quickstart covers problems related to setup failure and updating the IP address. The Frequently Asked Question database covers issues such as unsupported networks and compatibility of the service on multiple devices. Customers that may have questions about their new service can explore the billing section that covers free trial periods, subscriptions, and payment methods. The Help Center also guides customers by providing them with tips on how to use UnoTelly on multiple operating systems including Windows, Mac OSX, Linux/Ubuntu, and Chromebook. 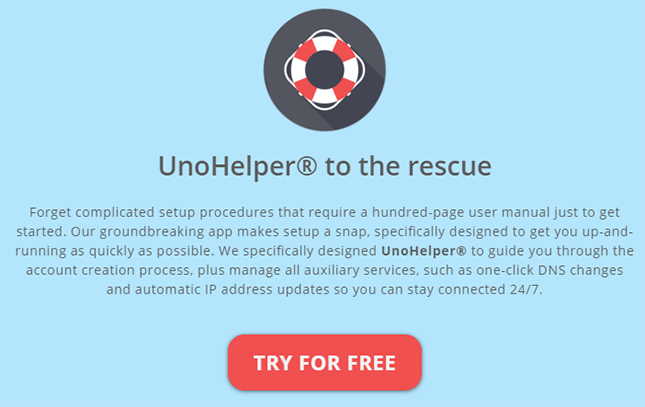 The UnoHelper offers helpful tips on initial installation of the service along with solutions for updating the IP and using the task scheduler. UnoTelly is compatible with mobile devices including smartphones and tablets. Initial setup instructions along with helpful tips are available for users of the iPad, iPhone, and iPod as well as those that may have Android devices. UnoTelly is also compatible to share with TV devices for enhanced capabilities. Customers can submit support tickets for additional help on the Solutions page. The option to upgrade from a prepaid subscription to a recurring subscription is also available on the Solutions page. The only minor issue with UnoTelly is the unavoidable downtime that can occur when using their type of service. This is not necessarily a negative mark against UnoTelly as any application that deals with providing DNS and VPN services will inevitably eventually run into technical glitches that result in servers either going offline or down entirely for a period of time. Depending on what a customer is trying to stream in or download, the issue may be the result of restricted networks in certain locations. Customers can stay in the loop by regularly monitoring the status of their servers and contacting support to report any problems or issues that they may be experiencing. UnoTelly’s Facebook page regularly posts updates about the status of their servers followed by comments relative to the approximate downtime and when they expect them to be back online. Upgrading their service subscription is yet another option for customers that may help to resolve technical issues and problems. UnoTelly offers some great service subscription plans at affordable prices. The benefits of using either their VPN or DNS service gives customers a full range of features that go way beyond what you typically find in everyday standard ISPs. Yes, you can use UnoTelly to stream in all your favorite shows from another country that are usually only accessible on a paid local network. There are other reasons, however, why having a private network just makes sense. The idea of having protection from potential hackers is in itself a very enticing feature, especially considering all the breaches that some major companies have been experiencing during recent years. Users that work with private or proprietary information that is sensitive or confidential would benefit from signing up for UnoTelly. Many businesses and especially larger corporations use private networks to protect company data. There is nothing better than shielding your content from outside snoopers.